I don’t have time to be bored these days. Not when there’s so much to do at the Smallest Smallholding. This weekend we totted up the hours working outside, but the time we’re putting in is really starting to pay off. I spent most of the weekend working on my hands and knees, using a hand fork to dig out several barrow loads of annual and perennial weeds. Using a hand fork saves my back – I would have been crippled after half an hour of digging with a fork. 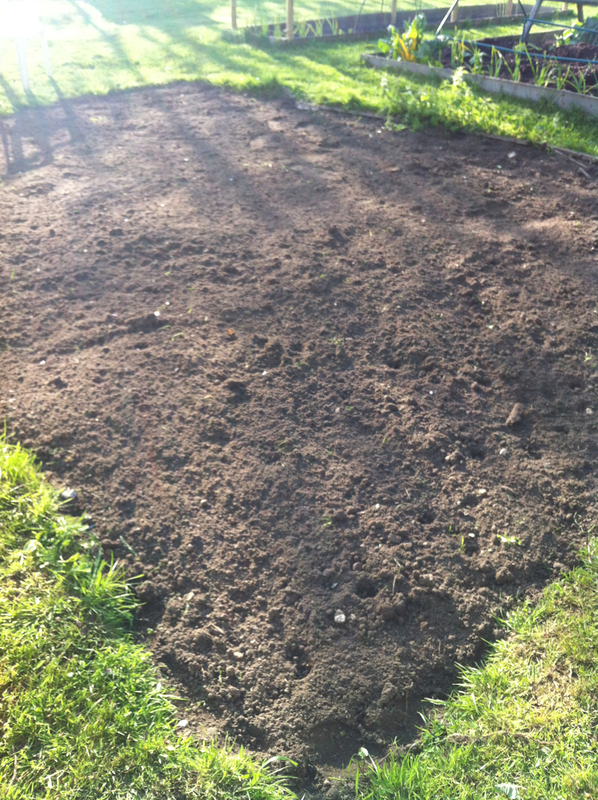 We now have a nice neat and very brown bed of bare soil. OK, so it’s not the prettiest bit of garden to look at, but THINK OF THE POTENTIAL. Because that’s where our lovely sort-of-brand-spanking-new polytunnel is going to go. We must have got the polytunnel around a year ago, but we’ve struggled to find the time and capacity to clear the polytunnel site properly. And in that intervening year-or-thereabouts, the labels have washed off and the instructions have gone AWOL. Luckily, First Tunnels have some handy online videos, so we’ll have to do our best with those. But first, we have to work out where the polytunnel beds and path will go. I’m thinking that we’ll need some weed suppressant membrane and then gravel… or if I can find a few extra pounds, some blue slate chips. The same for the outside of the tunnel, as we won’t be able to strim any stray grass easily around the outer sheet. Ideally I’d have some raised beds inside and move out my greenhouse staging for any seed growing I’m inclined to do. But this year because I know I have had so much back-to-basics work to do, I’ve tried to keep the growing simple – onions, garlic, potatoes etc – and keep the focus on getting everything properly sorted out, under control and ready for next year’s growing bonanza (because, you know, it will be a mega harvest and I will no longer be spending stupid amounts of money on sub-standard commercially produced pap from the supermarket grocery aisles). I am hoping that we can get a ‘polytunnel team’ together from family and get the thing up at some point this year. My mum suggested an ‘erection team’ but then quickly withdrew her suggestion. Or at least, renamed it. After we sniggered a lot. Once the polytunnel is up and running, Mum will nab our greenhouse and I’ll use the greenhouse site for another much-needed tool shed, with room to grow little bits and pieces in pots around it. I’ll probably paint the shed some cheerful colour, stick a gutter and waterbutt on it, and try to grow a climber up it. Maybe even have a hanging basket off the front for some tumbling tomatoes. I’m trying to think of ways to turn everything into a productive space because I am so sick of doling out money. I just want to disconnect from so much consumerism and my polytunnel plan is a major step in that direction. Onwards and upwards, as a dearly departed friend would say. Planting Blackcurrants – More Soft Fruit! We have a first tunnels polytunnel too. My husband and I put it up ourselves in a couple of days, the longest bit was digging the trench to lay the plastic in. Have fun! Hi Lucy, saw this on twitter, mulching rather than digging out weeds would save you a lot of time and effort and is great for soil and healthy vegetables. Thanks Charles! I’ve actually read and reviewed your book and saw your video about how you turned your patch into a successful no-dig kitchen garden… so am definitely inclined to start applying the no-dig approach with the polytunnel once it’s up. Looking forward to it and hope my harvests are even just half as successful as yours. Thanks again for dropping by and come back soon to see how I’m getting on!